We are all in the Christmas spirit here at Crafter’s Companion HQ and we hope you are all enjoying our Holly Jolly July event as much as we are! For day 7 of our Holly Jolly Advent Calendar we are bringing you an exclusive tutorial from the lovely Pamela Stewart. Check it out now! Crafters Companion Luxury red glitter card/Sheena’s white stamping card. Distress Inks: Ground Espresso, Aged Mahogany and Walnut Stain. ‘Our House’ stamp and die set and ‘Adornments’ stamp and die set from the Perfect Partners Mockingbird Hill collection. I die cut the house die into Sheena card, I then embossed the same die into the red glitter card. I didn’t die cut this one as the it is the back of the card and wanted to keep the strength as the windows would fall out. I then cut around the impression. I die cut the Adornments collection comprising of the kennel, side extension of the house, the fairy lights and the snow border. I cut 3 snow borders and 2 fairy lights. I coloured the die cuts with the Distress inks and water so that I could have variation of the shades. I used Walnut stain and Ground espresso for the main part of the house and side panels and Aged Mahogany on the roof. I then glued the kennel and side extension to the house. I cut two 3” squares from the red glitter card and scored at ½” on each side. These are the panels for to connect the front and back of the house. Stick the ½” sides to each end of the back panel ensuring the inner white card colour goes around the back of the house panel (so you don’t see the white) continue on other side of back panel. This forms the basis of the foldable card. I then cut up one of the snow borders to stick underneath the window frames and the kennel then added some twinkles to each of them, I coloured the fairy lights with pens and stuck that to the under hang of the house. I then got another snow border and used that along the top of the roof. I used a part of the other fairy lights and added that to the side extension. 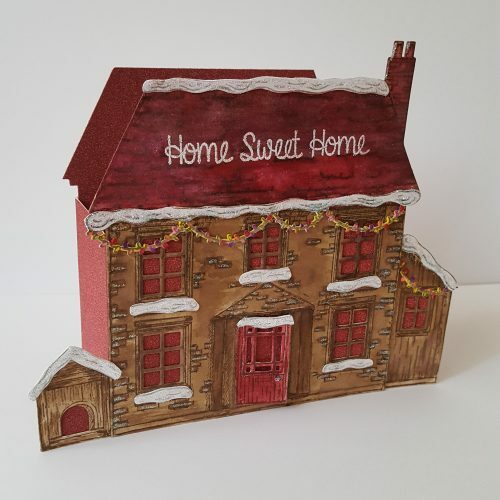 I chose the sentiment ‘Home Sweet home’ and heat embossed it in white and added some sparkle overlay to the roof. Finally I glued the front of the house onto the back using the other ½” flaps. These cards are excellent for sending through the post as they fold flat into the envelope. I have really enjoyed this tutorial and hope you have too! Make sure to keep checking the advent calendar for more exclusive tutorials, giveaways and promotions and don’t miss Sheena’s Weekend WOW shows this weekend!